The Country Cottage B&B is conveniently located in Bedfordview (Oriel) Johannesburg, South Africa. We are just minutes away from major Freeway’s and Highway’s in all directions. We are only 10 Minutes from the city centre and airport, 5 minutes from Eastgate and Bruma, 2 minutes from Bedford Centre, 25 minutes from Sandton and 35 minutes from Pretoria. Step into The Country Cottage B&B, where you will be welcomed by our friendly team who will do their utmost to make your stay an unforgettable one. 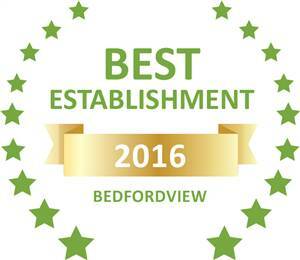 Based on reviews of establishments, The Country Cottage has been voted Best Establishment in Bedfordview for 2016. Our home from home B&B is ideally suited for the needs of the discerning business and leisure travelers, and we are securely located in a gated cul-de-sac. Catch a tan or take a cool drink in our honesty bar …the choice is yours. Enjoy the tranquil surroundings in our quiet dining area while we serve you your choice of either English or Continental breakfast……with a smile.